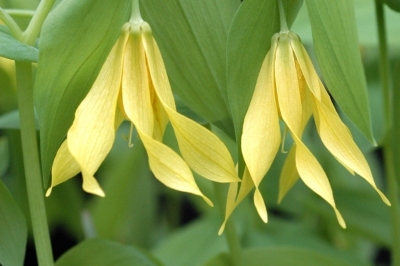 The long lasting flowers of Uvularia grandiflora are something I really look forward to every Spring. And every Spring, my robust stand of "Large Flowered Bellwort" slowly opens their large, pendulous, bright golden yellow flowers that resemble inverted flowing candle flames. Average plant height is about 18" - 24" and the medium green foliage of the plant provides a perfect foil for the unusually shaped flowers. Hardiness is USDA Zones 4-10 with full shade a must in the deep south. It's an excellent companion plant for Hostas, Hellebores, Arisaemas and Trilliums. The list goes on and on. I've built a nice stock of 5 year old flowering size Uvularia grandiflora and I know that they'll make a great addition to your garden and will bring you the same pleasure that they bring me every Spring for many, many years to come. The prices shown below include FREE SHIPPING via Insured Priority Mail on bareroot plants. Copyright © Barry Glick 1996-2014. All Rights Reserved.